BACKGROUND AND PURPOSE: It is unclear whether the costs and risks of mechanical therapies make them cost-effective. We examined whether interventions such as mechanical clot removal or disruption with angioplasty are cost-effective for acute ischemic stroke compared with best medical therapy. MATERIALS AND METHODS: We performed a cost-utility analysis of patients with acute stroke due to large intracranial artery occlusion presenting beyond the 3-hour window for IV tPA. Model inputs for the mechanical arm were derived from Multi MERCI trial data and a recent meta-analysis. For best medical therapy, we used rates of spontaneous recanalization, ICH, and functional outcomes based on a systematic literature review. Discounted QALYs were determined by using the Markov modeling for 65-year-old patients with acute ischemic stroke. RESULTS: On the basis of a systematic literature review, we modeled an 84% rate of recanalization with mechanical intervention and a 6.3% rate of symptomatic ICH. For best medical therapy, we modeled a spontaneous recanalization rate of 24% with a 2% rate of symptomatic ICH. Mechanical therapies were associated with a $7718 net cost and a gain of a 0.82 QALYs for each use, thus yielding a net of $9386/QALY gained. In sensitivity analyses, results were dependent on the rates of recanalization, symptomatic ICH rates, and costs of treatment. CONCLUSIONS: On the basis of available data, mechanical therapies in qualified patients with acute stroke beyond the window for IV tPA appear to be cost-effective. However, the inputs are not derived from randomized trials, and results are sensitive to several assumptions. The goal of tPA and endovascular interventions is to reopen brain arteries and restore blood flow to reduce the size of the infarct. In reality, many patients with acute stroke arrive after the 3-hour window for IV tPA.7 After the recent results of ECASS III,8 some centers in the United States would consider administration of IV tPA to qualified patients who present within 4 and a half hours of symptom onset. At certain medical centers, physicians may have the option of sending patients with acute ischemic stroke to a neurointerventional suite for intra-arterial thrombolysis with tPA or urokinase, angioplasty for clot disruption, or mechanical clot removal with either the Merci retriever (Concentric Medical, Mountain View, California) or the Penumbra System (Penumbra, Alameda, California). Aggressive treatments with these measures have been based on the hypothesis that recanalization of occluded vessels leads to reperfusion of the affected areas and prevents further permanent tissue damage. This approach has been justified by a series of studies showing that recanalization is associated with improved outcomes.9–11 Therapies also differ in terms of their risk of hemorrhagic conversion.11,12 In fact, there are no data from randomized trials supporting the efficacy of clot retrieval or mechanical disruption, so its clinical use is based on the presumption that by producing higher rates of recanalization with limited access to hemorrhage risk, its use will improve outcomes in selected patients. While there are some promising data showing higher rates of recanalization with aggressive interventional therapy and therefore possibly better functional outcome, it is still unclear if the upfront costs and risks would make this option a cost-effective one.6 Therefore, we conducted analyses to assess the cost-effectiveness of aggressive endovascular interventional treatments with mechanical clot removal or clot disruption with angioplasty in comparison with the best medical therapy for acute ischemic stroke treatment outside the 3-hour window for IV tPA, by using recanalization and rates of hemorrhagic conversion as intermediates to derive expected outcomes. We estimated lifetime costs and health consequences for NIR treatment compared with best medical therapy for patients with acute ischemic stroke who present after the 3-hour window for IV tPA, but within 8 hours of symptom onset (Fig 1). We followed established procedures for cost-utility analysis,13 including discounting future unrelated costs and health benefits by 3% annually to acknowledge the lower value of future events to society. We took a societal perspective, from which all resources consumed and all health benefits and harm, measured in QALYs, are pertinent. A Markov model was used to track until death the health conditions and costs for hypothetical cohorts subjected to NIR and medical therapies. 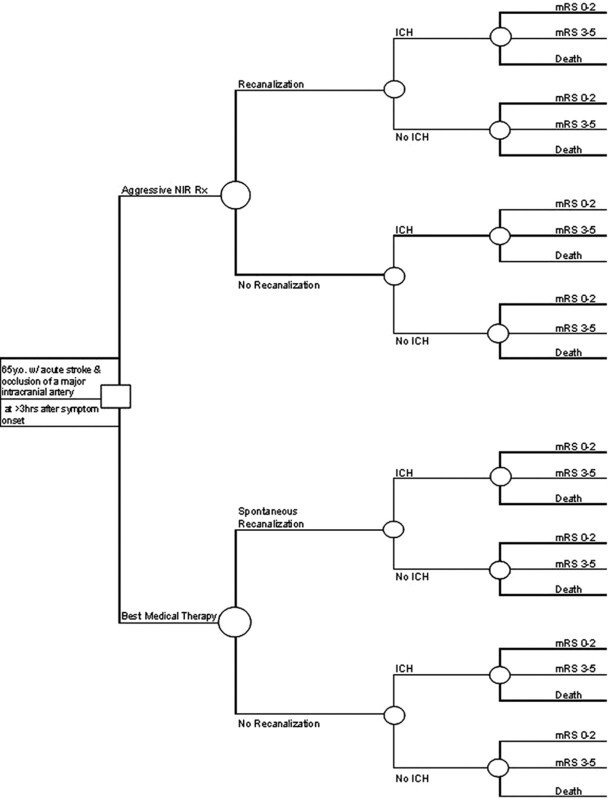 Decision tree used to compare cost-effectiveness of aggressive NIR treatment with the best medical therapy for a patient presenting with acute ischemic stroke within 8 hours of symptom onset but beyond the 3-hour window for IV tPA. Our base case considered a hypothetical cohort of 65-year-old patients, men and women, presenting with acute ischemic stroke and an occlusion of a major intracranial artery beyond the 3-hour window for IV tPA. Modeled patients were candidates for either treatment option, including the following: 1) aggressive NIR methods such as angioplasty, clot disruption, or mechanical clot removal; or 2) best medical therapy defined as antiplatelets and supportive care. Studies reporting data on aggressive NIR methods typically included some use of intra-arterial thrombolysis.9 The FDA approved the use of the Merci retriever for removal of clots from intracranial arteries on the basis of the results of the MERCI single-arm trial.1 In both groups in the model, the recanalization rate served as an intermediate to derive outcomes. The model assumed that the early management of these patients (aside from the acute treatment choice) followed by their admission to a stroke unit, the stroke work-up (including neuroimaging studies), laboratory tests, and cardiac evaluation, for the 2 treatment groups would be exactly the same and in accordance with the latest clinical guidelines.14 We assumed that symptomatic ICH was the only significant complication that would distinguish the treatment groups. We modeled 3 possible health outcomes: normal/mild disability (mRS score, 0–2), moderate-severe disability (mRS score, 3–5), or death. Model inputs were derived from the literature and data from the Multi MERCI single-arm trial (Table): Multi MERCI was an international multicenter prospective single-arm trial of thrombectomy in patients with large-vessel stroke treated within 8 hours of symptom onset.12 Based on the availability of data, we chose model inputs on the basis of the following hierarchy of evidence: 1) randomized trials, 2) most recent meta-analysis, 3) prospective cohort studies or nonrandomized trials, and 4) estimates from experts in the fields. Recanalization rates for both groups were derived from the most recent meta-analysis.9 For the aggressive NIR treatment arm, symptomatic ICH rates and mRS scores were calculated for subjects enrolled in the Multi MERCI single-arm trial,12 excluding those who received IV tPA. The mRS scores were obtained at 3 months posttreatment in the Multi MERCI single-arm trial. We defined good outcome as an mRS of 0–2. In the best medical therapy arm, data for symptomatic ICH rates and mRS scores were not readily available in the published literature. We made an assumption that the ratio of ICH rates for those who were spontaneously recanalized and those who were not would be the same as the ICH ratio seen in the aggressive NIR treatment arm. We obtained the symptomatic ICH rate for the spontaneous recanalization subgroup from the control arm in PROACT II.15 For the nonrecanalization subgroup, the symptomatic ICH rate was calculated by using the ratio mentioned above. In the best medical therapy arm, we used health outcomes published in the most recent meta-analysis.9 Good outcome was defined in the meta-analysis as functional independence, demonstrated by an mRS score of 0–2, and this score was stratified by recanalization versus no recanalization. Whenever possible, the meta-analysis used outcome status 3 months poststroke. If it was not available, then the final assessment closest to 3 months was used, ranging from status at discharge to status at 6 months poststroke. The meta-analysis did not differentiate between mRS scores for ICH and no ICH. Cost data were obtained from the Centers for Medicare & Medicaid Services.16 Fiscal year 2009 Medicare national average payment rates for mechanical embolectomy with (MS-DRG 23) and without (MS-DRG 24) major complication were used to calculate costs for the neurointerventional treatment arm. For the best medical therapy arm, calculations were made by using the 2009 Medicare national average payment rates for intracranial hemorrhage or cerebral infarct with (MS-DRG 64) and without (MS-DRG 66) major complication. For the base case, we applied the overall recanalization rates reported in the most recent meta-analysis: 84% for the aggressive NIR treatment arm and 24% for best medical therapy.9 Using raw data from the Multi MERCI trial, we modeled a 6.2% rate of symptomatic ICH for those who were recanalized in the aggressive NIR arm. For recanalization under best medical therapy, a 2% rate of symptomatic ICH was taken from the control arm of PROACT II.15 The symptomatic ICH rate for nonrecanalization in the aggressive NIR treatment arm was 17.3%, from the Multi MERCI data. Using calculations as described in the “Materials and Methods” section above, we modeled an ICH rate of 5.5% for the nonrecanalization subgroup under the best medical therapy. On the basis of these model inputs, aggressive NIR treatment was associated with a net cost of $7718 and a gain of 0.82 QALYs, yielding a net of $9386/QALY gained. Univariate sensitivity analyses evaluated the robustness of the model assumptions. In the sensitivity analysis, we assessed net U.S. dollars/QALY gained over a range of recanalization rates with NIR treatment (63%–100%) and with best medical therapy (14%–50%) (Fig 2). Aggressive NIR treatment was cost-effective if recanalization could be achieved at a rate ≥67%. With a base case value of 84% for the recanalization rate with NIR treatment, the intervention remained cost-effective as long as spontaneous recanalization rates were <47%. 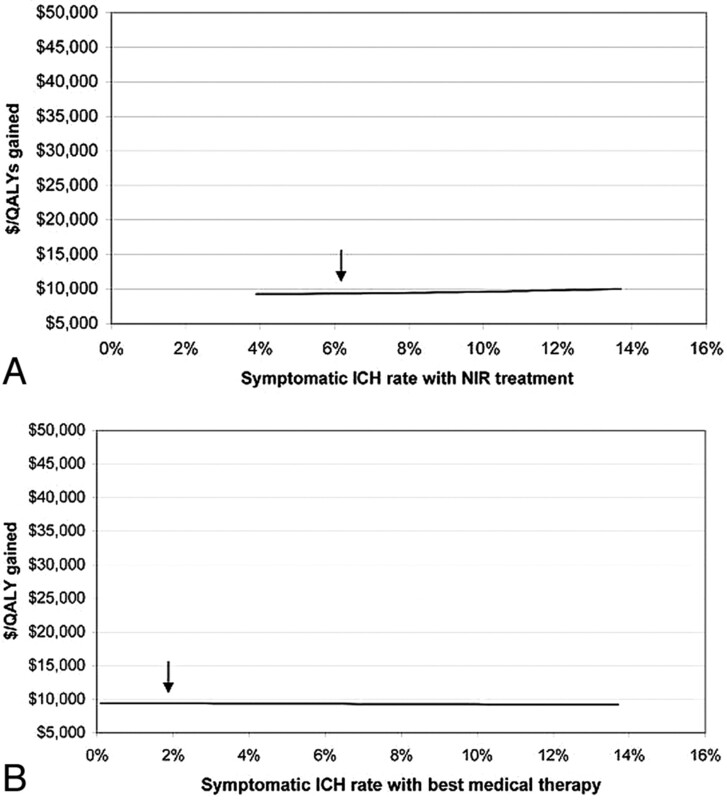 Symptomatic ICH rates for aggressive NIR treatment ranging from 4% to 14% had little effect on the cost-effectiveness of the model (Fig 3). Aggressive NIR treatment remained cost-effective even when Medicare reimbursement for the procedure and hospitalization were increased by 2.5 times the base-case value. Univariate sensitivity analyses of recanalization rates over an appropriate range of uncertainty for those undergoing NIR treatment (A) and best medical therapy (B). 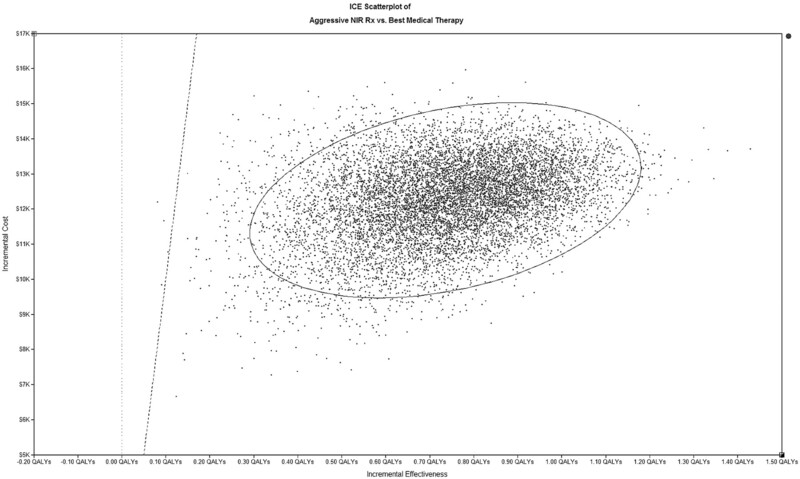 Arrows indicate base-case values for NIR treatment (84%) and best medical therapy (24%). Rates that lead to a net of <$50,000/QALY gained are usually considered cost-effective (bold dashed line). Univariate sensitivity analyses of symptomatic ICH rates with NIR treatment (A) and best medical therapy (B). Arrows indicate base-case values (6.3% for NIR and 2% for best medical therapy). Rates that lead to a net of <$50,000/QALY gained are usually considered cost-effective. Monte Carlo simulation of all input variables (except age and discount rate). The oval represents the 95% CI of the distribution of cost-effectiveness of the intervention, all of which is <$50,000/QALY as represented by the diagonal dashed line. Although no randomized trial of mechanical clot disruption or removal for ischemic stroke has been performed, the procedure has been widely adopted, primarily on the basis of cohort studies that have shown that rates of recanalization are higher than those seen with medical therapy and that recanalization is associated with improved clinical outcomes.9 Nonetheless, such aggressive NIR interventions are expensive and potentially risky, with higher rates of ICH. In our model, treating patients with acute ischemic stroke presenting beyond the 3-hour window for IV tPA with aggressive NIR treatments such as mechanical clot disruption or removal with or without intra-arterial thrombolysis was cost-effective compared with best medical therapy alone. Although we used the best available data, substantial uncertainty exists in key areas, including the impact of recanalization on clinical outcome and expected rates of recanalization in actual practice. 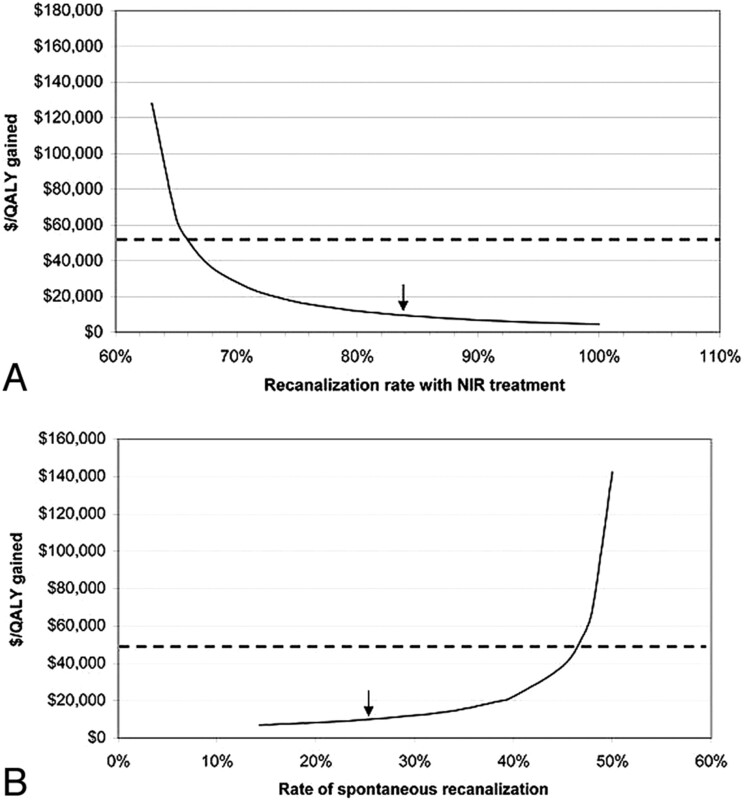 Determination of cost-effectiveness will ultimately depend on results of adequately powered randomized trials comparing NIR interventions with best medical therapy. Results from a recently published cost-effectiveness analysis of mechanical thrombectomy were in favor of aggressive treatment compared with standard therapy, with a cost-effectiveness ratio of $12,120/QALY gained.6 In that study, model inputs for recanalization and symptomatic ICH rates were taken from 2 studies: the MERCI single-arm trial1 for the mechanical thrombectomy arm and from the placebo group of the PROACT II study15 for the standard therapy arm. Compared with the Multi MERCI single-arm trial, the MERCI single-arm trial used an older generation of clot removal device and included fewer subjects. Multi MERCI also included patients who also received IV tPA, though we excluded these in our calculations for this study. In our study, we allowed the aggressive NIR treatment arm to include mechanical thrombectomy as well as angioplasty with or without intra-arterial thrombolysis to capture current practice more completely. Despite study differences, the final results are similar. With the assumptions outlined in the studies, the use of mechanical thrombectomy alone or in combination with angioplasty with or without intra-arterial thrombolytics appears to be cost-effective compared with medical therapy. The benefit seen in our study was driven largely by the fact that aggressive NIR treatment yielded a much higher rate of recanalization than the best medical therapy alone and subsequently better functional outcomes. In our model, in which spontaneous recanalization would occur 24% of the time, if recanalization with NIR treatment could be achieved at a rate ≥67%, then it would be a cost-effective measure. In Multi MERCI, the final recanalization rate was 69.5% for the use of the newer L5 Retriever (Concentric Medical) along with intra-arterial tPA,12 which would render this treatment option a cost-effective one based on the study model. With our study assumptions, the spontaneous recanalization rate would have to be >47% to render aggressive NIR treatment non-cost-effective. In the systematic review, a 50% rate was reported from 1 subgroup analysis of 14 patients who received placebos in the Australian Streptokinase Trial.21 With recanalization comes the concern for a higher rate of hemorrhagic conversion. The impact of ICH on dollars/QALY would be a significantly worse QALY and not much of an increase in direct costs because patients with ICH tend to have a high rate of mortality. However, pooled data from a recent meta-analysis on recanalization did not find an increased rate of symptomatic ICH with recanalization.9 Furthermore, sensitivity analysis of our model doubling the base-case rate of symptomatic ICH with NIR treatment, derived from Multi MERCI, did not change this study final result. The net cost per QALY gained for the base case ($9386) was well below the accepted threshold of $50,000/QALY. For the base case, we used the 2009 national average Medicare reimbursement for urban hospitals for the principal diagnosis of ischemic stroke and use of the Merci retriever with major complication (MS-DRG 023) or without (MS-DRG 024). In reality, costs for the procedure likely vary by institution. In the sensitivity analysis, more than doubling the base-case costs for aggressive NIR treatment still yielded a favorable result for being aggressive. On the basis of our estimates, the cost-effectiveness of aggressive NIR intervention for stroke is comparable with that for the administration of IV tPA for acute ischemic stroke presenting within 3 hours of symptom onset ($8000/QALY),5 carotid endarterectomy in symptomatic patients ($4100/QALY),22 and the coiling therapy of first-time ruptured aneurysms of <10 mm ($12,000/QALY) and ruptured aneurysms of >10 mm ($5000/QALY).23 Finally, a Monte Carlo simulation of all input variables (except age and discount rate) did not change the conclusions of this model. Our study has a number of limitations. The integrity of the model depends on the assumptions made and the availability of reliable data. Although recently good evidence emerges to support the expansion of an acute stroke treatment window with IV tPA from 3 hours to 4.5 hours, good reliable data on the rates of recanalization and ICH for the period between 3 and 4.5 hours are not yet available. Therefore, this model was set up for patients who present after the 3-hour window for IV tPA. The model has sufficient built-in flexibility so that when new reliable data are available for the variables of interest, a re-analysis with new assumptions can be performed. Spontaneous recanalization is poorly documented in the literature and will depend on the selection of subjects studied and the timing of evaluation, as seen in the small number of published studies.21,24–27 However, the recanalization rate with medical therapy would have to be quite high to change the study results, and the highest rate of recanalization with medical therapy previously reported was 50%.21 On the other hand, a lower recanalization rate with NIR treatment, below 67%, could render the intervention non-cost-effective. Cost-effectiveness analyses will need to be performed with newer generations of mechanical devices. Symptomatic ICH was not always reported in the literature and often was not specific for recanalization status.15,26–28 The Multi MERCI single-arm trial collected data on recanalization and ICH rates; however, the number of subjects in each group was small. The number of disabled survivors may be underestimated. Nonetheless, aggressive NIR treatment remained cost-effective even with ICH rates more than double those seen in Multi MERCI. Finally, without randomized trial data available, any conclusions on cost-effectiveness must be interpreted with caution. The availability of NIR treatments such as mechanical clot disruption or removal has opened up a new era for acute stroke treatment, especially for patients with large-artery occlusion who miss the window or are ineligible for IV tPA. Invasive NIR methods can have significant potential risks and costs. However, on the basis of current limited data, an aggressive approach with mechanical clot disruption or removal may be highly cost-effective. Still, results from this model should not be interpreted as providing additional evidence of the efficacy of NIR treatment, which requires performance of a randomized trial. A combination of clinical and cost considerations should ultimately guide selection of acute stroke therapies. Both authors contributed equally to the preparation of this manuscript. Dr Nguyen-Huynh, the corresponding author, had full access to all data in the study and had final responsibility for the decision to submit for publication. This work was funded by an unrestricted research grant from Concentric Medical. The sponsor did not have any role in the study design, analyses, or manuscript preparation. Accepted after revision June 25, 2010. You are going to email the following Is Mechanical Clot Removal or Disruption a Cost-Effective Treatment for Acute Stroke? The Alphabet of Imaging in Acute Stroke: Does It Spell Improved Selection and Outcome?